Every bloke wants to find a way to make his best mate’s bucks party memorable. When you live in beautiful Sydney, Australia, that makes this momentous task a little easier. 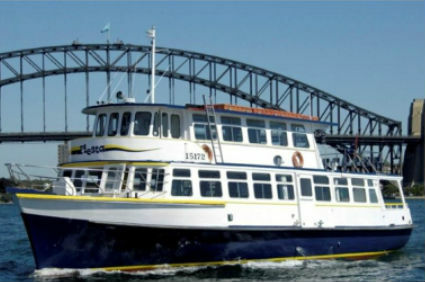 There’s a lot to do in Sydney, but if you’re looking for a really brilliant idea for a great bucks party, then you should definitely consider a Laser clay target shooting cruise onSydney Harbour. There’s no better way to have a good time than to get out on the open sea with a group of your best mates. You’ll have the time of your lives, and the man of the houror will have a day to remember with our party cruises. 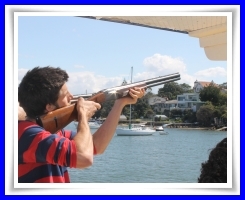 And for the duration of your Laser clay target shooting cruise Sydney Harbour, you’ll also be able to enjoy an BBQ lunch with sausages and onions, and 3 salads and bread rolls. And we also offer a cash bar for spirits cheaper than bar prices, this includes a, drink package with wine, beer, and soft drinks you can handle for the duration of your harbour cruise. It’s everything your best mate could ask for: shooting, a harbour cruise, and the best of food and drink. And the man of the houror will get a r-rated strip show add $250 so he will be King of the World. Laser clay target shooting is a fun and popular pastime. Men are nothing if not competitive, so any activity that allows you to compete against each other is always a plus. 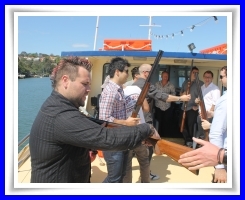 But a new twist on Laser clay target shooting is laser lazer target shooting cruise on Sydney harbour. 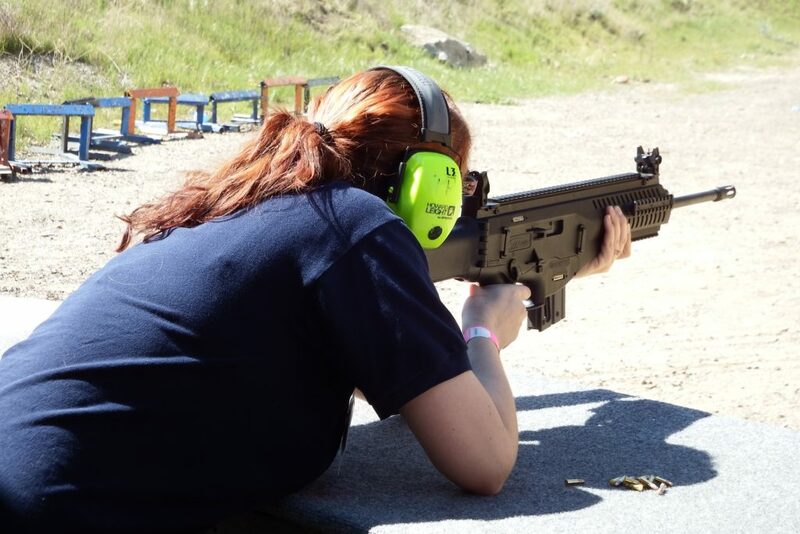 This allows you to shoot and to keep track of your own score accurately, thanks to the microchip embedded in the gun. Each participant gets two shots per target. And, since everyone gets an opportunity to shoot at the same target when experiencing a Laser clay target shooting cruise Sydney Harbour, there’s no question of whether or not there was a mysterious gust of wind on one person’s turn versus another’s. 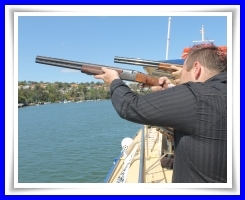 But another benefit of going on a Laser clay target shooting cruise Sydney Harbour is that the backdrop of your day will be beautiful Sydney Harbour itself. You’ll see famous sights like the Sydney Opera House, the Sydney Harbour Bridge, the Taronga Zoo, and Luna Park. You’ll get to be out on the open sea with your best mates, enjoying the great outdoors and the fresh sea air. Two and a half hours seems hardly enough time to enjoy it all, but, somehow, it’s enough on our party boat.